A disastrous Los Angeles Lakers season came to a bitter and shocking end earlier this week when team president Magic Johnson suddenly resigned from his post. There’s been a lot of speculation about what led to Magic’s departure. What we do know is that these Lakers are going to look a lot different next season. That might start on the court with Los Angeles’ brass, whoever it might be, finding some running partners for LeBron James. But the Lakers are also likely going to be searching for a head coach to replace Luke Walton. Here’s one name to throw into the conversation. She’s an assistant under Gregg Popovich with the San Antonio Spurs. She’s qualified. Her name is Becky Hammon. And here’s why she’s the perfect fit for LeBron and Co. The experience factor: Dating back to her WNBA days, Hammon has the experience. Hammon played with the New York Liberty from 1999-2006. She also played eight seasons with the San Antonio Stars, earning six All-Star appearances in the process. In between this time, Hammon starred overseas for the renowned CSKA Moscow as well as four other stops. The women’s game might not be the same as the NBA, but she gained a ton of experience running the team as a point guard and being a captain at multiple stops. Learning from Pop: The legendary Spurs head coach continues to build an amazing coaching tree. It’s not really too shocking to realize that 10 former Popovich coaches or players are head coaches or were at some point during their careers. This list includes championship-winning coaches such as Steve Kerr. It also includes respected minds, Mike D’Antoni, Mike Budenholzer and Brett Brown. 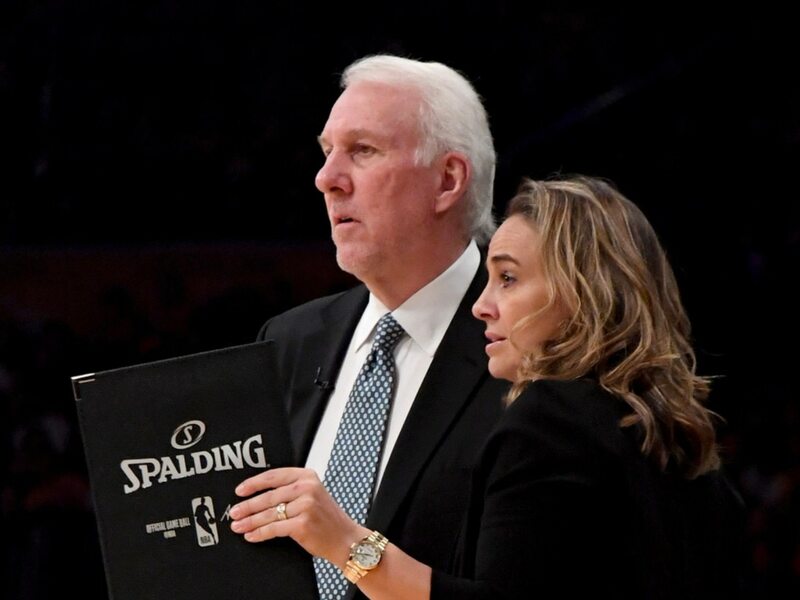 Popovich’s assistant since 2014, Hammon has worked her way up the ranks within his staff to a seat in the front row. She’s in Pop’s ear throughout the game. If not the Lakers: It isn’t like Hammon’s name is coming out of left field here. Hammon has been bandied about as a potential head coach each of the past two offseasons. It’s not like this would somehow be an exercise in gender equality. Last summer saw her interview for the then-vacant Bucks head coaching job. She also drew interest for the Colorado State men’s basketball job. Widely respected around league circles, Hammon would also be able to bring in some Spurs assistants to help her in Los Angeles. That’s no small thing for a first-time head coach. Walton’s staff did not help him with the Lakers. The Jeanie Buss equation: Los Angeles’ owner has made it clear that this is her team. One of the few women yielding this type of power, Buss has the ability to make a major statement. One of the NBA’s most-decorated organizations being led by two powerful women. The optics here would be huge. It would change the entire landscape of the sports world. Should Hammon have success, it would open up a plethora of other options for women across multiple platforms. The King James component: This could very well be a great fit for the game’s best player. James has spoken out about equality. He’s one of the primary social advocates around the sports world. We’ve seen this time and time again. While Buss likely won’t even confer with James as it relates to a new head coach, James himself can make sure this is a smooth transition. It’s the equivalent of James putting into action the words we’ve heard from the man over the past several years. He wants social change, right? If so, this would be a tremendous next step. There are a ton of qualified candidates for the impending Lakers opening. Hammon is just one of the them. Her colleague with the Spurs, Ettore Messina, should get some play this offseason. But instead of the Lakers going with some sort of retread like Tyronn Lue, why not try something new? The status quo hasn’t worked. And while a greenish head coach in Luke Walton has proven to be a failure, it’s not like veteran coaches in Los Angeles have had success. Just ask Bryon Scott and Mike Brown. Hammon would represent a change of culture within the Lakers’ organization. She’d have the respect of the players, LeBron James included. More so than anything else, she’s as qualified as any candidate to take over this sinking ship. It’s something Buss and Co. should seriously consider.